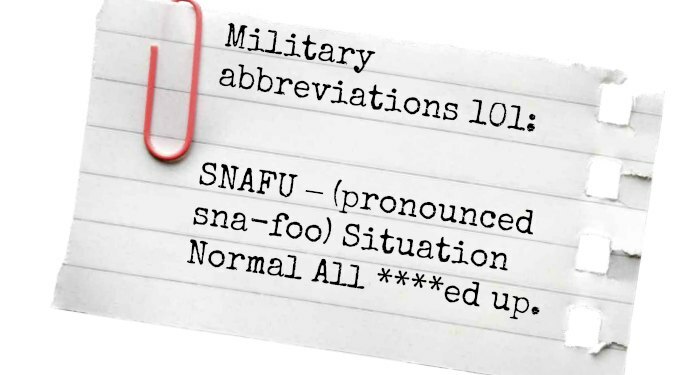 Inside: Confused by military acronyms and abbreviations? Let’s simplify. This the ultimate list of acronyms and abbreviations that military spouses may need to know. If you are a military girlfriend or spouse, you have probably received a text message full of acronyms that were completely new and confusing. Maybe you asked what they meant. Or maybe (like me) you confused them for actual words. (What is a pov and why would you want to use it anyway?) One way or another, you probably realized that even though you’re not required to memorize all these new words, being familiar with them certainly helps. To help you out, here is the giant cheat sheet of acronyms you may encounter as a military significant other or spouse. It doesn’t include every single one, because there are waaayyy too many. And some are specific to just one branch. But this should work for most situations and give you clues to those crazy acronyms your service member keeps dropping into conversations. Soon, you’ll be seasoned enough to just reply Rgr (Roger) to such messages. AFSC- Air Force Specialty Code. This designates a service member’s “job” in the Air Force. For other branches, see MOS. AWOL- (pronounced a-wall) Absent Without Leave. Occurs if a member is UA for more than 30 Days. On day 31 he is considered a “deserter” and pay and benefits stop. BAH- Basic Allowance for Housing. What the military pays each month if you do not live on base. Calculated by rank and zip code. Unmarried service members typically do not receive this. BAS- Basic Allowances for Subsistence. What the military pays each month for a married service member’s food, since they will not generally eat at the chow hall/mess hall. Unmarried service members do not receive this. BCGs – Birth Control Glasses. Large, black plastic framed glasses issued during basic training to service members in need of corrective lenses. Generally considered unattractive. BDU– Battle Dress Uniform. The old-fashioned camouflaged uniforms that are no longer issued. BX– Base Exchange. A Large mall-like store on an Air Force base. BZ – Bravo Zulu. Shorthand for “Congratulations, great job!” (Navy Term). CO- Commanding Officer of a unit. COLA- Cost of Living Allowance, for families stationed overseas or in a remote location without access to base discounts. CDC- Child Development Center. On-base daycare at affordable rates. CREDO- (pronounced creed-oh) Chaplain’s Religious Enrichment Development Operation. These are free marriage enrichment retreats offered to military couples. DEERS- Defense Enrollment Eligibility Reporting System. This lists the dependent spouse and children of a service member, and allows them to receive Tricare benefits. DFAS- (pronounced dee-fas) Defense Finance and Accounting Service. The source of military paychecks. DitY Move- (pronounced Ditty) Do it Yourself Move. When the service member packs and moves their own belongings to a new duty station, instead of having the military moving company do it. Now referred to as PPM. DoDS– (pronounced dods) Department of Defense Schools. Overseas duty stations have American schools managed by DoDS. EOD – Explosive Ordnance Disposal. EOS or EAS- End of Service or End of Active Service. When a contract ends and a service member leaves the military. FOB – (pronounced fob) Forward Operating Base. A base that is larger than a COP (Combat Outpost), but smaller than a Main Operating base. They tend to be located in less dangerous areas than a COP and offer luxuries like hot water. FRG– Family Readiness Group. Military spouses, parents, and children can find support and information in their unit FRG. FRO– (pronounced froe) Family Readiness Officer (Marine Corps). FUBAR – (pronounced foo-bar) *****ed up Beyond All Recognition. HALO – (pronounced hey-low) High Altitude, Low Opening. Refers to a parachute jump where the parachute opens close to the earth. HHG– Household Goods. Your furniture, clothes, and belongings that are packed up and then delivered to the next location during a military move. IED – Improvised Explosive Device, often used as an attack in the Middle East. IEDs are hidden in a variety of ways and can be detonated remotely. ITT– Information, Tickets, and Tours. Discounted entertainment services available to military families. This is where you get your military discount Disneyland tickets. LES– Leave and Earnings Statement. A 1-page paper that can be printed from the MyPay website, showing all the pay, benefits, taxes, and deductions from the paycheck for the next month. MilSo- Military Significant Other. A girlfriend, boyfriend, fiancé, fiancée, or anyone in a relationship with a service member who is not yet married. MOS– Military Occupational Specialty. Someone’s ‘job’ in the military, usually defined by a 4- digit number. A common example: 0311 is a Rifleman. MRE – Meal Ready to Eat. A 3,600 calorie meal with a heating system packaged in one plastic brick. Universally despised. MWR– Morale, Welfare, and Recreation. This office handles events and entertainment on military bases, and may manage some base facilities like gyms and swimming pools. NCO– Non-Commissioned Officer. An enlisted person of the rank E-4 through E-6 (depending on branch). A Staff Non-Commissioned Officer is SNCO. OCONUS- (pronounced oh-cone-us) Outside the Continental United States. These overseas locations include Hawaii and Alaska. OPSEC- (pronounced opp-seck) Operational Security. This means protect information about the unit and troop movements. I.e., don’t announce the Homecoming date on social media. PERSEC- (pronounced purr-seck) Personal Security. Information about your own whereabouts and identity, which you should always protect. PCS- Permanent Change of Station. When the service member receives orders to move to another base. PII– Personally Identifiable Information. Data such as social security number, driver’s license, birthday, etc. that can be used to steal your identity. These must be safeguarded and treated carefully. PoA- Power of Attorney. The paperwork that allows a service member to delegate authority to a spouse or family member to handle their finances and legal matters while they are away. Also known as the paper you need to get anything done during a deployment! PPM– Personally Procured Move. The new term for a Do-it-Yourself move, formerly called DitY. PRT or PFT– Physical Readiness Test or Physical Fitness Test. Annual physical fitness test used for most branches. Slightly different from a CFT, which is a Combat Fitness Test. PT– Physical Training, aka mandatory exercise. ROTC– (often pronounced rott-sea) Reserve Officer Training Corps. Students who begin part-time military training during college, then receive an officer commission at graduation. SERE – (pronounced sear) Survival, Evasion, Resistance, and Escape. A survival school for specific military occupational specialties training. SNAFU – (pronounced sna-foo) Situation Normal All ****ed up. SSN- Social Security Number. Memorize your spouse’s. You will need it for everything. Not even kidding. TDY or TAD- Temporary Duty. A short-term assignment. TSP- Thrift Savings Plan. The military 401(k) plan that service members can add to for retirement savings. UCMJ- Uniform Code of Military Justice. The rule of law that applies to all service members. UOTD- Uniform of the Day. The required military uniform for a given date or event. VA- Office of Veteran Affairs, which manages health care and benefits for veterans. WilCo- Will Comply (as a text message or email response).